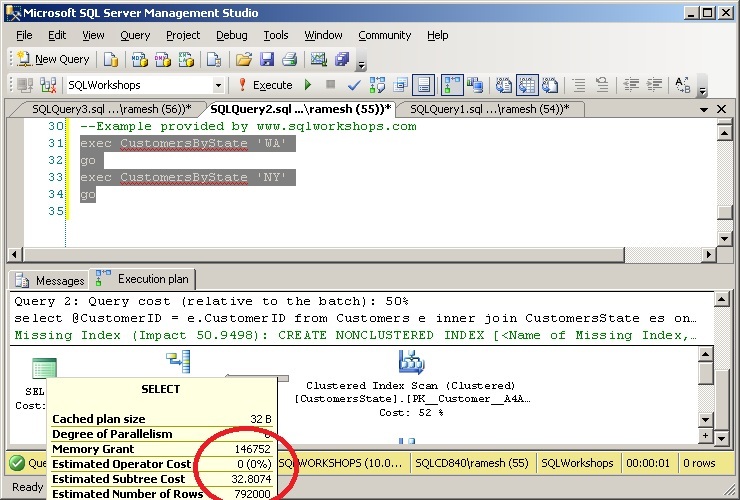 SQL Server estimates Memory requirement at compile time, when stored procedure or other plan caching mechanisms like sp_executesql or prepared statement are used, the memory requirement is estimated based on first set of execution parameters. This is a common reason for spill over tempdb and hence poor performance. Common memory allocating queries are that perform Sort and do Hash Match operations like Hash Join or Hash Aggregation or Hash Union. This article covers Hash Match operations with examples. 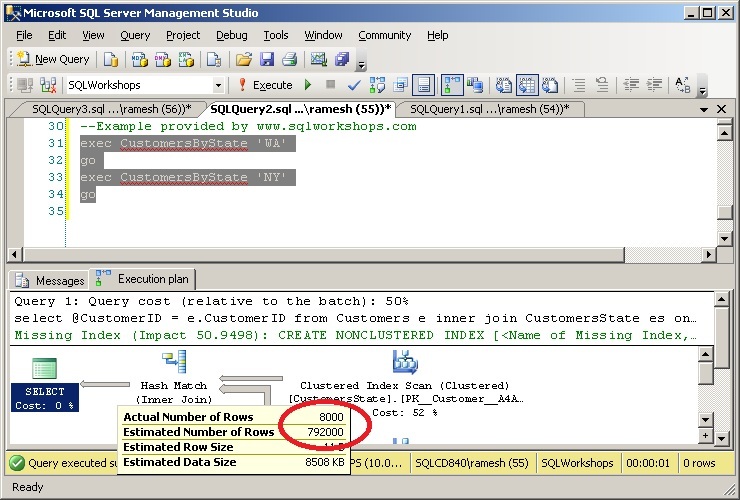 It is recommended to read Plan Caching and Query Memory Part I before this article which covers an introduction and Query memory for Sort. 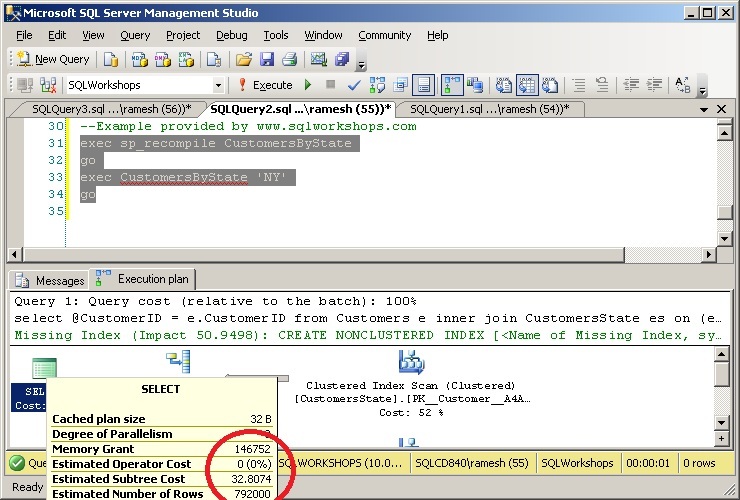 In most cases it is cheaper to pay for the compilation cost of dynamic queries than huge cost for spill over tempdb, unless memory requirement for a query does not change significantly based on predicates. This article covers underestimation / overestimation of memory for Hash Match operation. Plan Caching and Query Memory Part I covers underestimation / overestimation for Sort. It is important to note that underestimation of memory for Sort and Hash Match operations lead to spill over tempdb and hence negatively impact performance. Overestimation of memory affects the memory needs of other concurrently executing queries. In addition, it is important to note, with Hash Match operations, overestimation of memory can actually lead to poor performance. Let’s create a Customer’s State table that has 99% of customers in NY and the rest 1% in WA. Customers table used in Part I of this article is also used here. 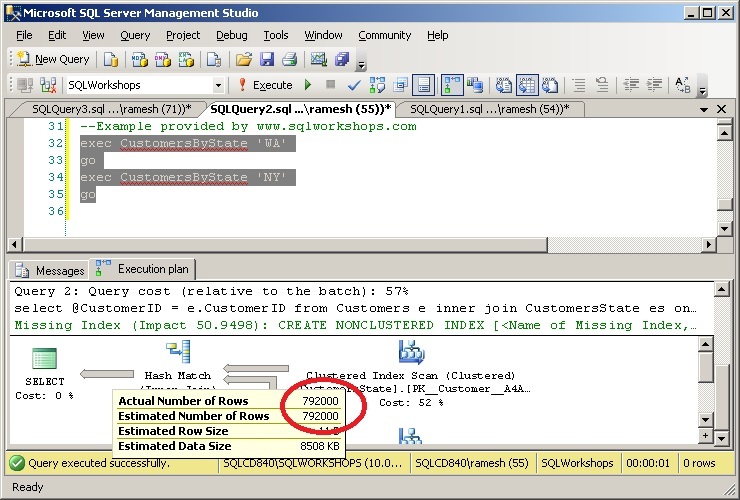 To observe Hash Warning, enable 'Hash Warning' in SQL Profiler under Events 'Errors and Warnings'. 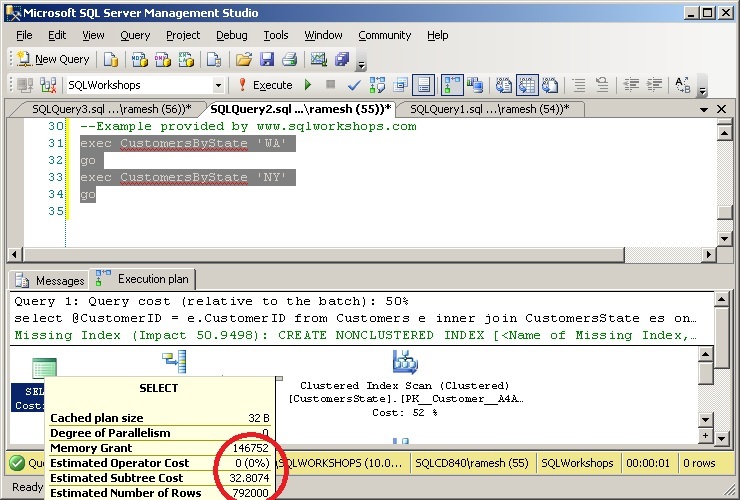 Let’s create a stored procedure that joins customers with CustomersState table with a predicate on State. Let’s execute the stored procedure first with parameter value ‘WA’ – which will select 1% of data. 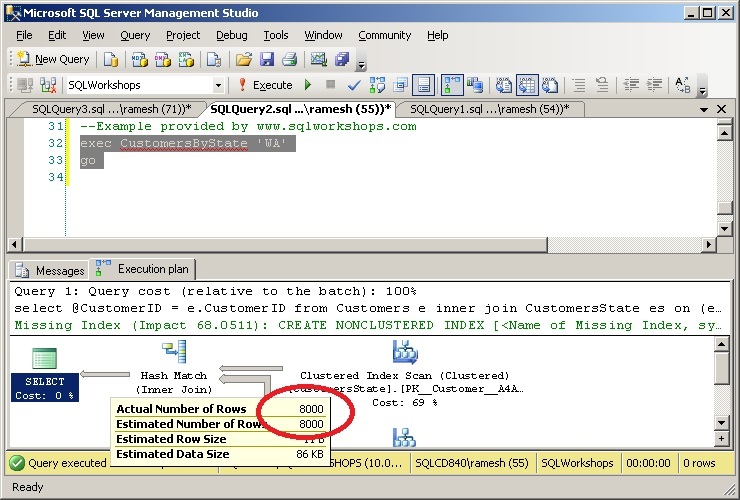 The stored procedure took 294 ms to complete. 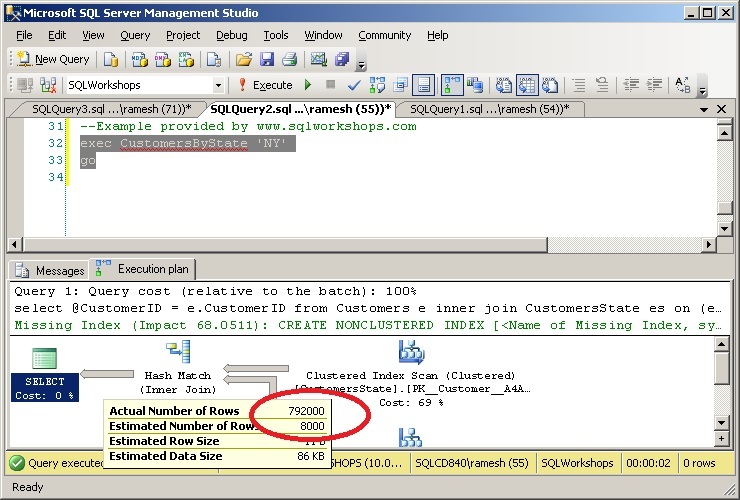 The stored procedure was granted 6704 KB based on 8000 rows being estimated. 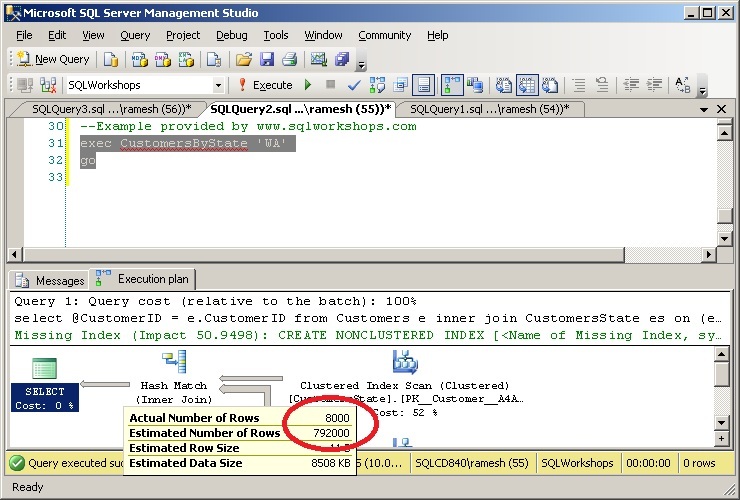 The estimated number of rows, 8000 is similar to actual number of rows 8000 and hence the memory estimation should be ok. 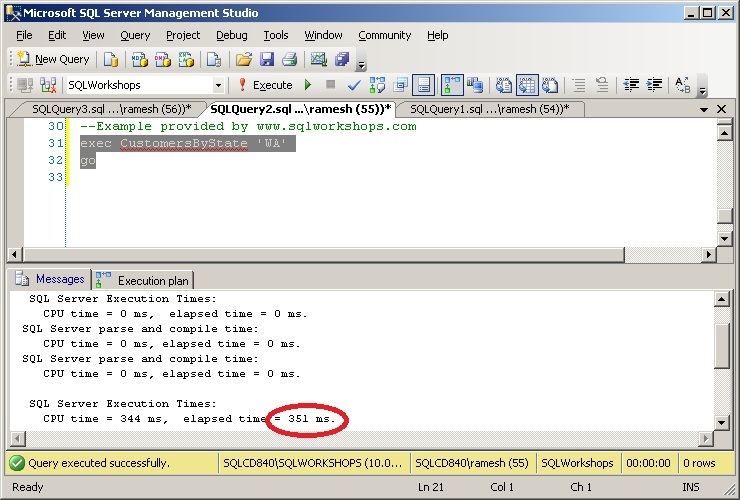 There was no Hash Warning in SQL Profiler. 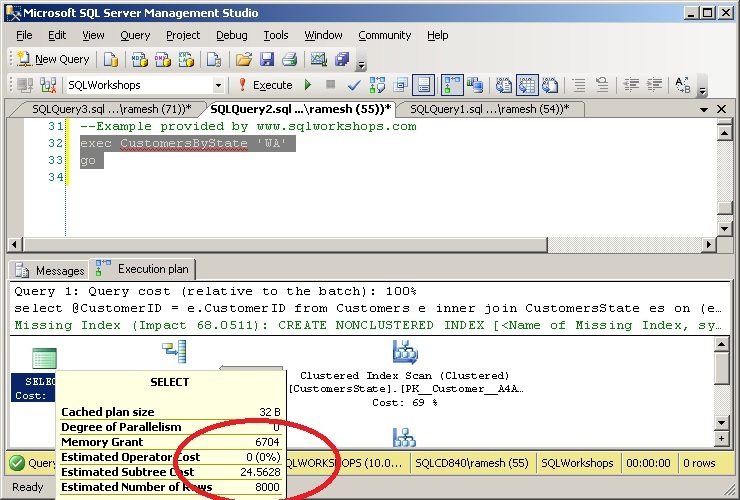 To observe Hash Warning, enable 'Hash Warning' in SQL Profiler under Events 'Errors and Warnings'. 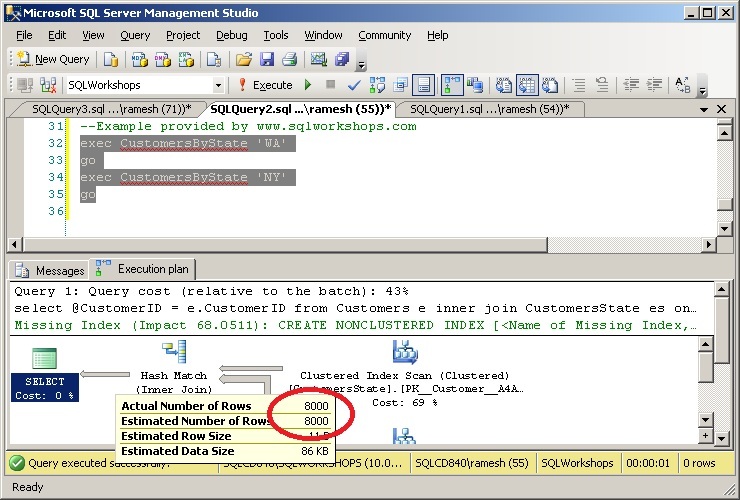 Now let’s execute the stored procedure with parameter value ‘NY’ – which will select 99% of data. 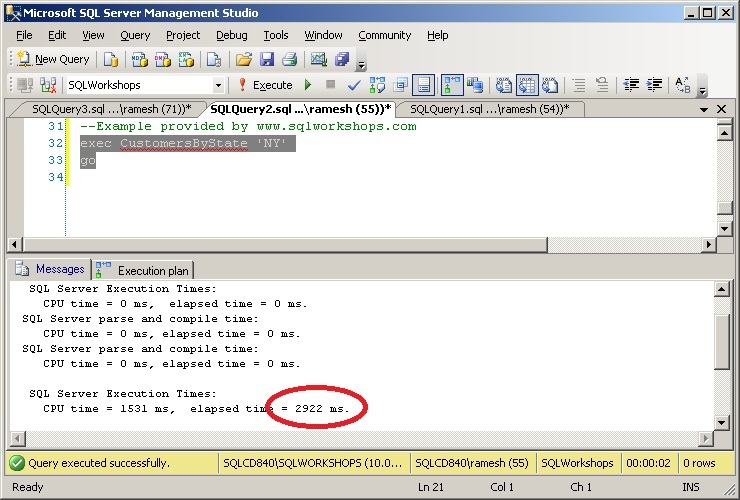 The stored procedure took 2922 ms to complete. 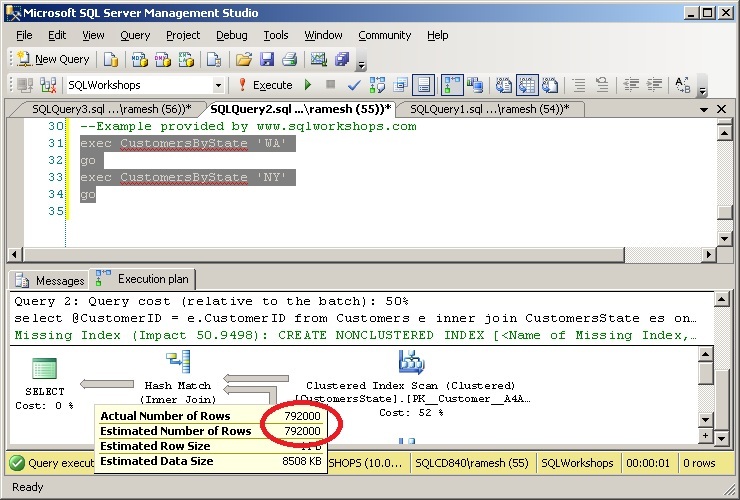 The estimated number of rows, 8000 is way different from the actual number of rows 792000 because the estimation is based on the first set of parameter value supplied to the stored procedure which is ‘WA’ in our case. This underestimation will lead to spill over tempdb, resulting in poor performance. There was Hash Warning (Recursion) in SQL Profiler. 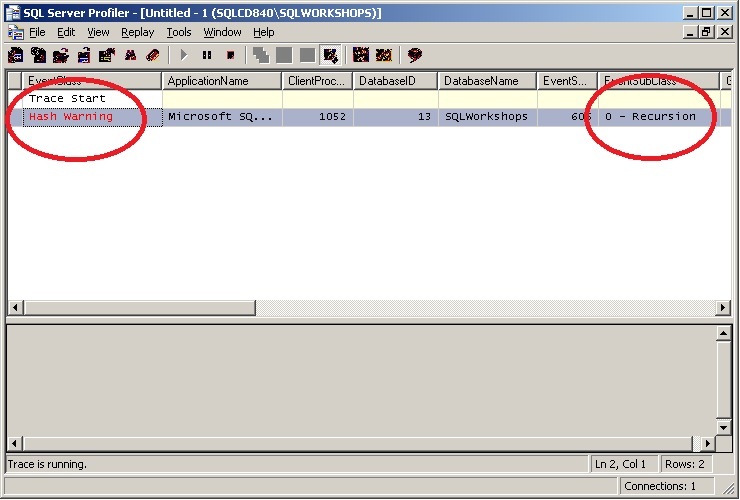 To observe Hash Warning, enable 'Hash Warning' in SQL Profiler under Events 'Errors and Warnings'. The stored procedure was granted 146752 KB of memory. The estimated number of rows, 792000 is similar to actual number of rows of 792000. Better performance of this stored procedure execution is due to better estimation of memory and avoiding spill over tempdb. 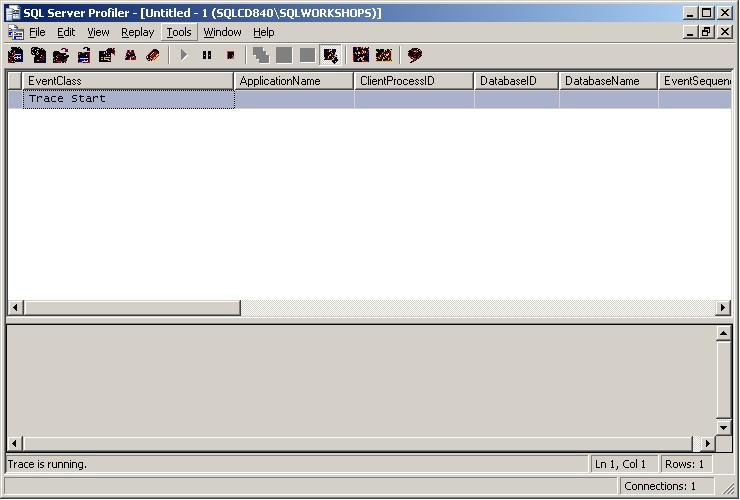 There was no Hash Warning in SQL Profiler. Now let’s execute the stored procedure with parameter value ‘WA’. The stored procedure took 351 ms to complete, higher than the previous execution time of 294 ms. 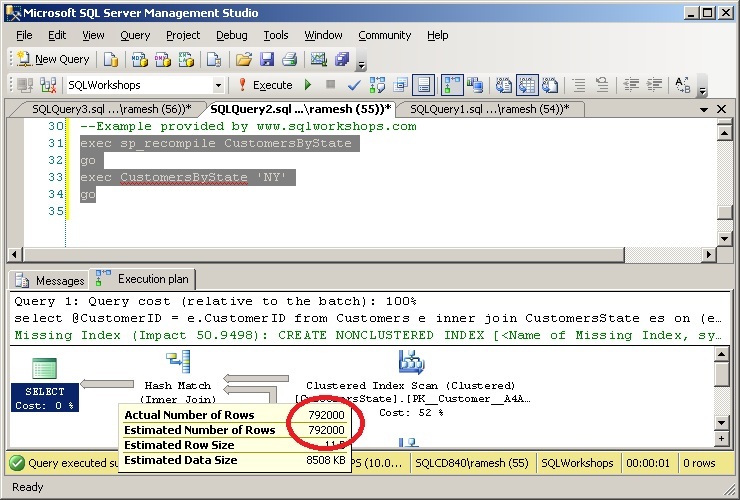 This stored procedure was granted more memory (146752 KB) than necessary (6704 KB) based on parameter value ‘NY’ for estimation (792000 rows) instead of parameter value ‘WA’ for estimation (8000 rows). 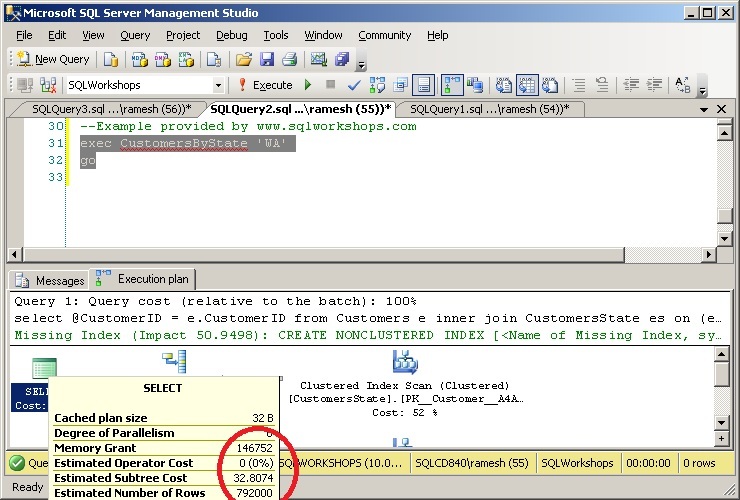 This is because the estimation is based on the first set of parameter value supplied to the stored procedure which is ‘NY’ in this case. This overestimation leads to poor performance of this Hash Match operation, it might also affect the performance of other concurrently executing queries requiring memory and hence overestimation is not recommended. The estimated number of rows, 792000 is much more than the actual number of rows of 8000. This issue can be avoided by not caching the plan for memory allocating queries. Other possibility is to use recompile hint or optimize for hint to allocate memory for predefined data range. Let’s recreate the stored procedure with recompile hint. Let’s execute the stored procedure initially with parameter value ‘WA’ and then with parameter value ‘NY’. 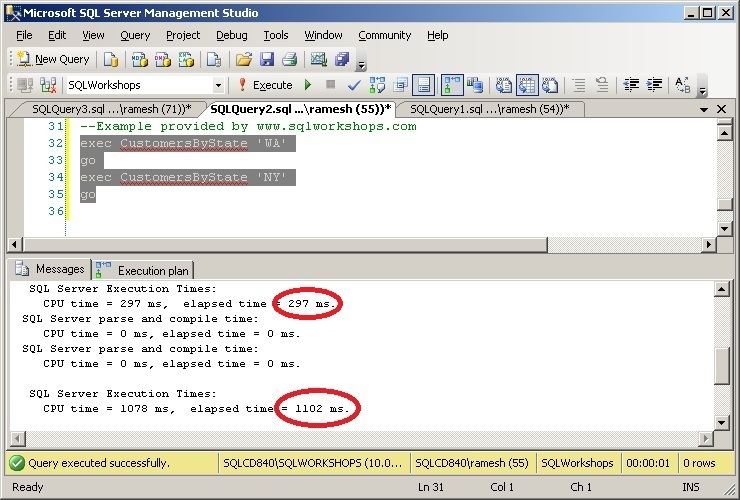 The stored procedure took 297 ms and 1102 ms in line with previous optimal execution times. The stored procedure with parameter value ‘WA’ has good estimation like before. Estimated number of rows of 8000 is similar to actual number of rows of 8000. 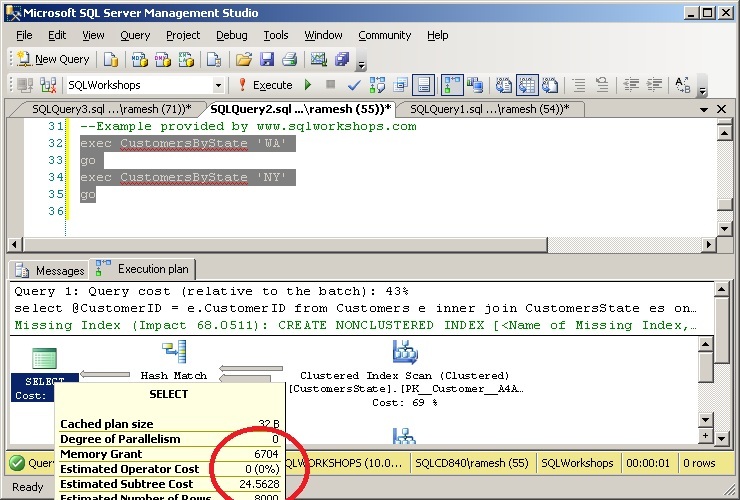 The stored procedure with parameter value ‘NY’ also has good estimation and memory grant like before because the stored procedure was recompiled with current set of parameter values. Estimated number of rows of 792000 is similar to actual number of rows of 792000. 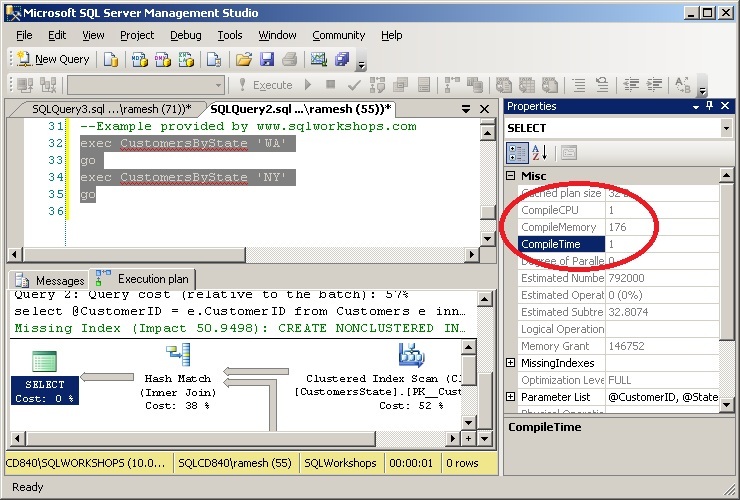 Let’s recreate the stored procedure with optimize for hint of ‘NY’. The stored procedure took 353 ms with parameter value ‘WA’, this is much slower than the optimal execution time of 294 ms we observed previously. This is because of overestimation of memory. 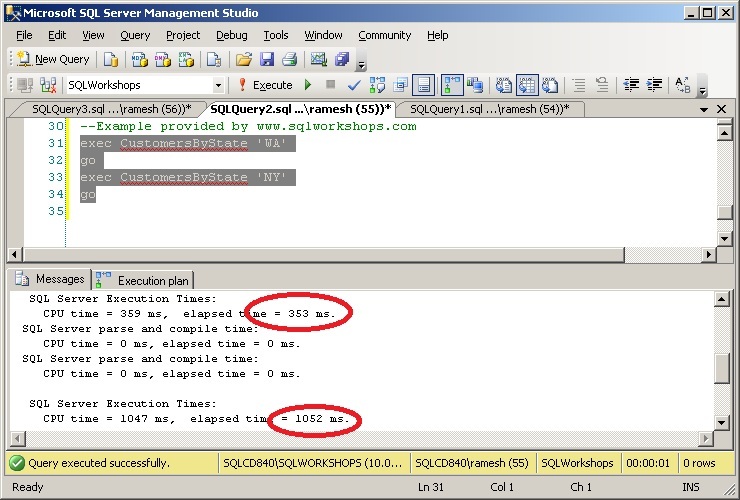 The stored procedure with parameter value ‘NY’ has optimal execution time like before. 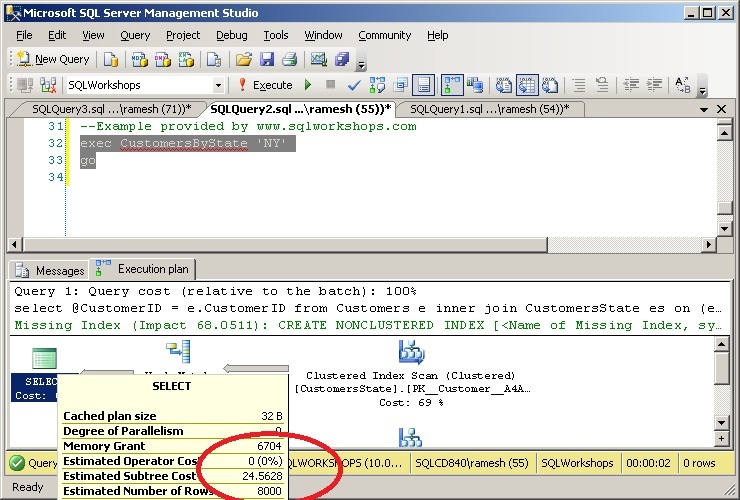 The stored procedure with parameter value ‘WA’ has overestimation of rows because of optimize for hint value of ‘NY’. Unlike before, more memory was estimated to this stored procedure based on optimize for hint value ‘NY’. 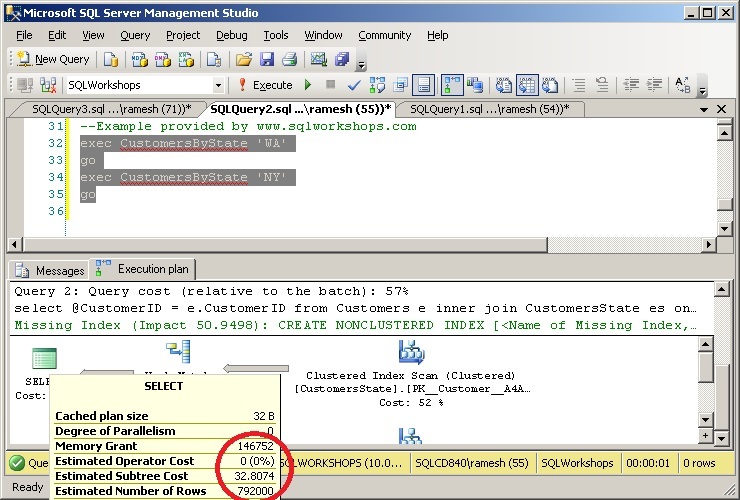 The stored procedure with parameter value ‘NY’ has good estimation because of optimize for hint value of ‘NY’. Estimated number of rows of 792000 is similar to actual number of rows of 792000. 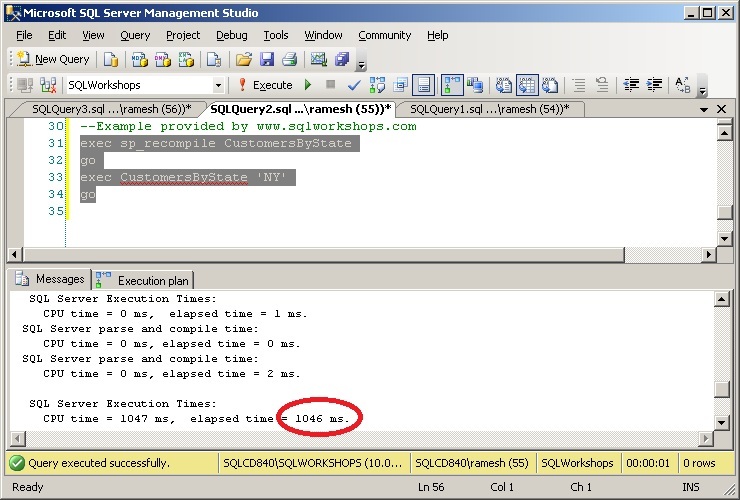 Optimal amount memory was estimated to this stored procedure based on optimize for hint value ‘NY’.